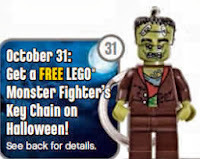 Head over to your nearest Lego Store on October 31st to get a FREE Lego Monster Fighter Keychain! What a great treat! Visit your local LEGO Store on the first Tuesday of every month and you can learn how to build a cool LEGO mini model, and take it home – for free! Quantities are limited and offer is good while supplies last only. A new model will be available every month and will be specially themed to that month – ask a Store Associate for details! Models are not for sale and cannot be purchased. One free per child. Event is open to children aged 6 to 14 only. Check with your local LEGO Store for dates and times.